Teamwork Service Dog Training Books give the reader wonderful insight and understanding into dog behavior. The writers, Nordensson and Kelley, have had years of experience and clearly explain how to relate to your dog and the best methods to use in service assistance dog training. They provide step by step instruction for the training exercises. There is valuable information on understanding your dog and his/her behavior, excellent training tips for each exercise, and advice to prepare you for changes in your life and your dog's life. Both books have color photographs showing people, with different disabilities, training their own dogs. In TEAMWORK, tips for people on crutches or in manual and power wheelchairs are mentioned. Praise and food reward are explained and emphasized. To help the novice trainer, equipment needed for training a dog is discussed. You will learn how to give a command and get your dog's attention. Some of the training skills covered in this book are: teaching your dog to sit, lie down, stay, stand, heel, wait, and do a controlled walk with you. TEAMWORK II is for the individual who wants his or her dog to be more than a companion and friend. Service training exercises are explained and taught. This is done primarily through true case histories from disabled individuals who have taught their own dogs helpful exercises such as: picking things up (anything from a dime to a crutch), retrieving items (like shoes, phone or wheelchair), turning lights on and off, opening doors, helping you up from the floor, helping you dress. 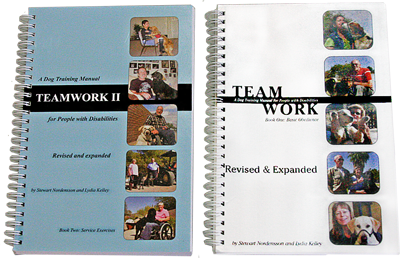 The Teamwork Training books help people with disabilities realize that they can share the companionship and joy of owning a dog. With a little work and dedication, they can learn how to make their dog a well behaved friend and companion. They don't have to rely on someone else to do it for them, and they don't have to forgo the pleasure of canine companionship. The end result of these Teamwork Training Books is TEAM-a person and dog who understand one another and bond strongly together.